More than a decade ago, RFID technology was touted to revolutionize supply chain management. In the ensuing years, however, the impact of RFID programs has had mixed results. Walmart reported in 2013 that it lost $3 billion in revenue because of inventory mismatches. Macy's, on the other hand, said more recently that its RFID program is having a positive impact on sales and profitability. The National Retail Federation reports that retailers’ inventory shrinkage, or lost items, averaged 1.38 percent of retail sales, or $45.2 billion in 2015, up by $1.2 billion from 2014, although several factors are at play. Yet, with retail operations exploding in scale, pundits believe RFID technology use will only increase, and can net millions in cost savings for retail and other industries, as it is now used across many fields. 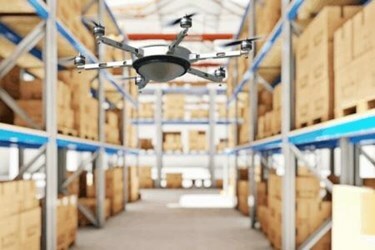 The inefficiency of RFID in tracking inventory is a present challenge, but MIT researchers believe they have a solution in their radio frequency-based RFly system that uses small drones to track items in a warehouse. "By enabling drones to find and localize items and equipment, this research will provide a fundamental technological advancement for solving these problems,” says Fadel Adib, the Sony Corporation Career Development Assistant Professor of Media Arts and Sciences, who led the group of developers at MIT Media Lab. Drones flying around in enclosed spaces shared by people present a safety hazard, so the team designed its drones to be small, lightweight, and equipped with plastic rotors to minimize injuries in case of collisions. However, the small drones are unable to carry RFID readers, so the researchers designed a method of using the drones to relay signals to and from a standard RFID reader, allowing for the more effective locating of tags with an average error of roughly 19 centimeters, reports UPI. Also, the drones are too small to carry an array of antennas, so as they fly up and down aisles, they take readings at different times and different locations, simulating the multiple elements of an antenna array. Because each drone is continuously moving, the phase shift of the signals that reach the reader result not only from the drone’s position relative to the RFID tag, but also its position relative to the reader. So, the team equipped each drone with its own RFID tag, so that the reader can identify the drone's signal contributing to the total phase shift and remove it. While relays are common in communication systems, the “conceptual novelty” in this research is “that one of the ends is battery-free, and they want to location-track the battery-free device, which requires phase-consistent measurements. These together make the problem quite challenging,” Swarun Kumar, an assistant professor of electrical and computer engineering at Carnegie Mellon University, told MIT News.